This page contains a character guide for Catwoman in Injustice 2. Here you’ll find movelists, combos, juggles, strategy guides and recommended gear for the villain character. For more Injustice 2 content, head over to our Injustice 2 top page. Master thief Selina Kyle has won the hearts of many men – including Batman. She sides with law and order when it suits her, but rarely lets her feelings for the Dark Knight interfere with her life of crime. Catwoman has trained herself to peak physical condition and trained herself to be incredibly talented at gymnastics, making her lithe, fast, and nimble, in and on the battlefield. Selina’s real skills come in the art of burglary, where she relies on stealth and her silence to rob her targets blind. When forced to fight, Catwoman relies on fast strikes, aided by the claw attachments to her gloves and boots, inflicting powerful, numerous strikes that while not high damaging on their own, add up for a cumulative effect. For strong strikes, Selina relies on a bullwhip both for striking, binding, and reeling her enemy in towards her. When Catwoman successfully evades an attack, 1 Scratch will be added to her Scratch meter. Each time Catwoman lands an attack she has a chance to have 1 Scratch added to her Scratch meter. Pressing ○ will perform a damaging combo with each Scratch adding additional damage, up to 5 maximum of 5 hits. Meter Burn R2 (must press R2 in the middle of Cat-Lateral Damage). Cat-Lateral Damage can only be Meter Burned when 4 or 5 scratches are available. Catwoman’s character trait is the ability to perform a small combo which is best used at the end of combos. Each time Catwoman lands a Basic Attack she has a chance to have 1 Scratch added to her Scratch Meter. The chances of a Scratch being awarded increases with each hit of a combo. 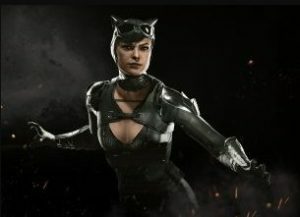 Catwoman can also be awarded with 1 Scratch with each successful dodge from an opponent’s attack when she uses her Special Moves High Feline Evade and/or Low Feline Evade. Pressing the Character Trait button will perform a damaging combo, with each scratch adding an additional hit, up to a maximum of 5 hits. Below are combo and juggle inputs for Catwoman , including corner strategies and restarts. Catwoman has a black leather catsuit that covers her entire body, except for the underside of her arms. She has a large, circular golden zipper and brown modified corset. She wears a brown leather backpack and knee-high boots attached to a taloned apparatus resembling cat’s paws. She also wears chain mesh elbow-length gloves attached to clawed gauntlets that enable her to slash. She wears a cowl that resembles a cat’s head, metallic goggles that sit on her forehead, and a tail that doubles as her whip. Catwoman now has a purple leotard and leggings with a mask that covers most of her face and resembles a cat’s head. She also has a small backpack compared to her default one and wears short rubber gloves attached to smaller claw gauntlets. Grey DeLisle previously voiced Catwoman in Batman: Arkham City. Isis, Catwoman’s cat which appears in her intro and outro, is playable in the S.T.A.R. Lab Missions. She was the 9th character to be confirmed for the playable roster, with her own gameplay trailer to boot. This is very attention-grabbing, You’re an excessively skilled blogger. I have joined your feed and look forward to searching for more of your wonderful post. Also, I’ve shared your web site in my social networks!